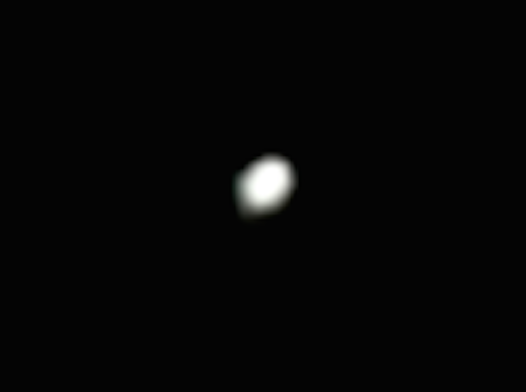 UFO SIGHTINGS DAILY: Glowing Orb Over Hampshire, England On May 20, 2015, UFO Sighting News. Glowing Orb Over Hampshire, England On May 20, 2015, UFO Sighting News. I happened to be in the bathroom of my apartment this evening and as I switched off the light I became aware of a very bright light off to the West which was evident, even though the patterned glass. Curious, I opened the window and was fascinated to see a very brilliant bluish-white light at approximately 60° above the horizon and at what I would estimated to be a half-mile distant. It was exhibiting movement consistent with a bobbing motion which when observed over a period of several minutes meant that the UFO moved across the sky from South to North in a rolling-wave motion - and was probably at altitude over or in the vicinity of the B3040 (Romsey Road) to the West of Stanmore, Winchester which is a relatively built-up area with open fields beyond. Well, I grabbed the camera and binoculars and made some observations before committing to filming and photographing it. Although I had it in view for seventeen minutes, and I took at least sixteen photographs using the camera (a Samsung PL122 5x 4.7-23.5mm 1:3.3-5.9 26mm - not good at all for this sort of thing) set to night photography and locked off as best I could against the window frame, most of them came out with considerable distortion resulting in the object, although in frame, appearing as a line or twin lines of bluish-white light. However, four frames were acceptable and I've provided them here. The one taken at 22:45 is at maximum zoom, but the ones which were taken at 22:47, 22:50 hours were all taken with the camera set to normal (zoom off) and show the yard behind my home, with the open window on the right and the object in the middle upper distance. The other light off to the left and lower down is from a nearby building light. Motion Footage was also produced with the camera zoomed in, in an attempt to reveal more detail. While under observation the object repeatedly blinked out and then re-illuminated and as there was nothing between my POV and the UFO I have to assume that the darkening was intentional, although why this was done remains a mystery.